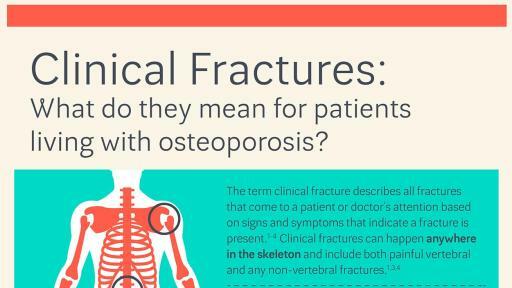 Clinical Fractures: What do they mean for patients living with osteoporosis? 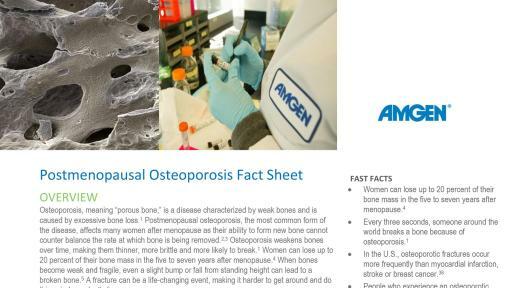 PR Newswire, THOUSAND OAKS, Calif. and BRUSSELS (Sept. 18, 2016) - Amgen (NASDAQ:AMGN) and UCB (Euronext Brussels: UCB) today announced findings from the FRAME study showing that the investigational agent romosozumab significantly reduced the incidence of new vertebral fractures in postmenopausal women with osteoporosis through 12 and 24 months, meeting the study’s co-primary endpoints. The results from the Phase 3 study, the first to evaluate fracture risk reduction as early as one year as a primary endpoint, were published in the New England Journal of Medicine (NEJM) and presented today in an oral session at the Annual Meeting of the American Society for Bone Mineral Research (ASBMR) in Atlanta. Romosozumab works by binding and inhibiting the activity of the protein sclerostin, and as a result, has a dual effect on bone, both increasing bone formation and decreasing bone breakdown. 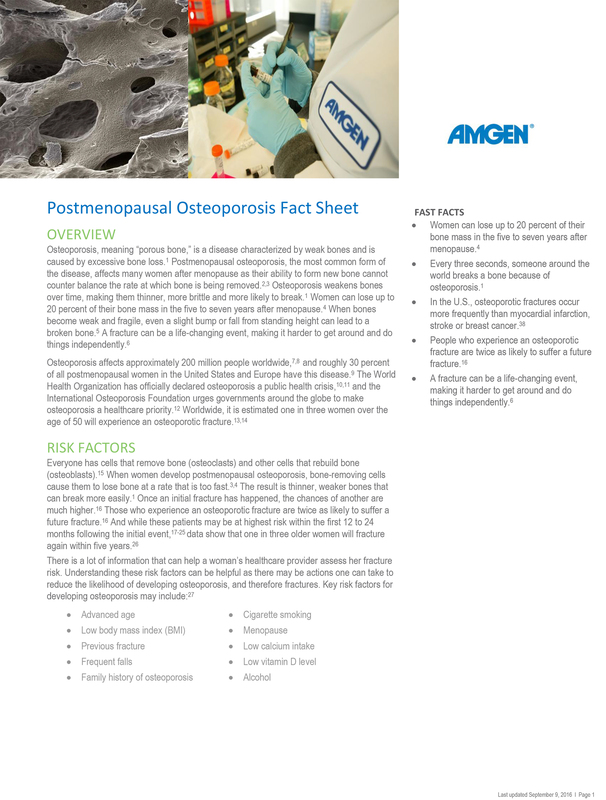 FRAME (FRActure study in postmenopausal woMen with ostEoporosis), which enrolled 7,180 women, showed that those randomly assigned to receive a monthly subcutaneous 210 mg dose of romosozumab experienced a statistically significant 73 percent reduction in the relative risk of a new vertebral (spine) fracture through 12 months, the first co-primary endpoint, compared to those receiving placebo (fracture incidence 0.5 percent versus 1.8 percent, respectively [p<0.001]). Of interest, the data showed that by six months, new vertebral fractures occurred in 14 romosozumab and 26 placebo patients, and between six to 12 months, fractures occurred in two additional romosozumab patients versus 33 additional placebo patients. For those patients who received romosozumab in year one, fracture risk reduction persisted through month 24 after both groups transitioned to denosumab treatment in the second year of the study; there was a statistically significant 75 percent reduction in the risk of vertebral fracture at month 24 (the other co-primary endpoint) in patients who received romosozumab followed by denosumab versus placebo followed by denosumab (fracture incidence 0.6 percent versus 2.5 percent, respectively [p<0.001]). In the second year of the study, new vertebral fractures occurred in five patients who transitioned from romosozumab to denosumab and 25 patients who transitioned from placebo to denosumab. When looking at clinical fractures, which encompass all symptomatic fractures (both non-vertebral and painful vertebral fractures), patients receiving romosozumab experienced a statistically significant 36 percent reduction in the relative risk of a clinical fracture, a secondary endpoint, through 12 months compared to those receiving placebo (fracture incidence 1.6 percent versus 2.5 percent, respectively [p=0.008]). A 33 percent reduction in relative risk of clinical fracture was observed through 24 months after patients transitioned from romosozumab to denosumab compared to patients transitioning from placebo to denosumab (nominal p=0.002, adjusted p=0.096). Romosozumab resulted in a 25 percent reduction compared to placebo in the relative risk of non-vertebral fractures through month 12, another secondary endpoint, but the reduced risk was not statistically significant (fracture incidence 1.6 percent versus 2.1 percent, respectively, [p=0.096]). For the non-vertebral fracture endpoint, the overall fracture incidence in the study was lower than expected (2.1 percent in the placebo group in year one versus an expected rate of 3.5 percent). In a sub-study of 126 subjects, romosozumab increased bone mineral density with gains of 9.7 percent and 4.7 percent from baseline by six months at the lumbar spine and total hip, respectively, and gains of 13.3 percent and 6.8 percent at 12 months (all comparisons versus placebo p<0.001). Bone mineral density continued to increase in the romosozumab group after transitioning to denosumab, reaching 17.6 percent and 8.8 percent increases from baseline at the lumbar spine and total hip, respectively, at 24 months (p<0.001 compared to placebo-to-denosumab group for all comparisons). The percentage of patients with adverse events and serious adverse events in the 12-month double-blind period and 24-month study period were balanced overall between the treatment groups. Injection site reactions, mostly mild in severity, were reported in 5.2 percent of patients in the romosozumab treatment group and 2.9 percent in the placebo group during the 12-month period. There were two positively adjudicated events of osteonecrosis of the jaw in the romosozumab treatment group, one after completing romosozumab dosing and the other after completing romosozumab treatment and receiving the initial dose of denosumab. There was one positively adjudicated event of atypical femoral fracture after three months of romosozumab treatment. Adjudicated serious cardiovascular events and cardiovascular deaths were balanced between treatment groups. Romosozumab is an investigational bone-forming monoclonal agent and is not approved by any regulatory authority for the treatment of osteoporosis. It is designed to work by inhibiting the activity of the protein sclerostin and has a dual effect on bone, both increasing bone formation and decreasing bone breakdown. Romosozumab is being studied for its potential to reduce the risk of fractures in an extensive global Phase 3 program. This program includes two large fracture trials comparing romosozumab to either placebo or active comparator in more than 10,000 postmenopausal women with osteoporosis. Amgen and UCB are co-developing romosozumab. FRAME is a multicenter, international, randomized, double-blind, placebo-controlled, parallel-group study in postmenopausal women with osteoporosis, defined as low bone mineral density at the total hip or femoral neck. The study evaluated the effectiveness of romosozumab treatment, compared with placebo, in reducing the risk of new vertebral fractures through 12 months. The study also further evaluated if romosozumab treatment for 12 months followed by denosumab treatment for 12 months, compared with placebo followed by denosumab treatment, was effective in reducing the risk of new vertebral fractures through 24 months. In addition, clinical fracture (a composite endpoint which encompasses all symptomatic fractures, both non-vertebral and painful vertebral fractures) risk reduction, non-vertebral fracture (fractures outside of the spine, excluding sites that are not considered osteoporotic, fractures due to high trauma or pathologic fractures) risk reduction and other endpoints were assessed at 12 and 24 months. Prolia is indicated for the treatment of postmenopausal women with osteoporosis at high risk for fracture, defined as a history of osteoporotic fracture, or multiple risk factors for fracture; or patients who have failed or are intolerant to other available osteoporosis therapy. In postmenopausal women with osteoporosis, Prolia reduces the incidence of vertebral, nonvertebral, and hip fractures. Prolia is indicated for treatment to increase bone mass in men with osteoporosis at high risk for fracture, defined as a history of osteoporotic fracture, or multiple risk factors for fracture; or patients who have failed or are intolerant to other available osteoporosis therapy. Prolia is indicated as a treatment to increase bone mass in men at high risk for fracture receiving androgen deprivation therapy for nonmetastatic prostate cancer. In these patients Prolia also reduced the incidence of vertebral fractures. Prolia is indicated as a treatment to increase bone mass in women at high risk for fracture receiving adjuvant aromatase inhibitor therapy for breast cancer. Prolia® is contraindicated in patients with hypocalcemia. Pre‐existing hypocalcemia must be corrected prior to initiating Prolia®. Prolia® is contraindicated in women who are pregnant and may cause fetal harm. Prolia® is contraindicated in patients with a history of systemic hypersensitivity to any component of the product. Reactions have included anaphylaxis, facial swelling and urticaria. Prolia® contains the same active ingredient (denosumab) found in XGEVA®. Patients receiving Prolia® should not receive XGEVA®. Clinically significant hypersensitivity including anaphylaxis has been reported with Prolia®. Symptoms have included hypotension, dyspnea, throat tightness, facial and upper airway edema, pruritus, and urticaria. If an anaphylactic or other clinically significant allergic reaction occurs, initiate appropriate therapy and discontinue further use of Prolia®. Hypocalcemia Hypocalcemia may worsen with the use of Prolia®, especially in patients with severe renal impairment. In patients predisposed to hypocalcemia and disturbances of mineral metabolism, clinical monitoring of calcium and mineral levels is highly recommended within 14 days of Prolia® injection. Adequately supplement all patients with calcium and vitamin D.
ONJ, which can occur spontaneously, is generally associated with tooth extraction and/or local infection with delayed healing, and has been reported in patients receiving Prolia®. An oral exam should be performed by the prescriber prior to initiation of Prolia®. A dental examination with appropriate preventive dentistry is recommended prior to treatment in patients with risk factors for ONJ such as invasive dental procedures, diagnosis of cancer, concomitant therapies (e.g., chemotherapy, corticosteroids, angiogenesis inhibitors), poor oral hygiene, and co‐morbid disorders. Good oral hygiene practices should be maintained during treatment with Prolia®. The risk of ONJ may increase with duration of exposure to Prolia®. For patients requiring invasive dental procedures, clinical judgment should guide the management plan of each patient. Patients who are suspected of having or who develop ONJ should receive care by a dentist or an oral surgeon. Extensive dental surgery to treat ONJ may exacerbate the condition. Discontinuation of Prolia® should be considered based on individual benefit‐risk assessment. Atypical low‐energy, or low trauma fractures of the shaft have been reported in patients receiving Prolia®. Causality has not been established as these fractures also occur in osteoporotic patients who have not been treated with anti‐resorptive agents. 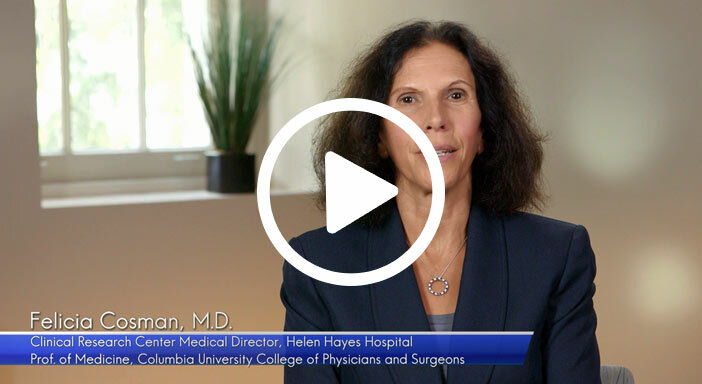 In a clinical trial (N=7,808) in women with postmenopausal osteoporosis, serious infections leading to hospitalization were reported more frequently in the Prolia® group than in the placebo group. Serious skin infections, as well as infections of the abdomen, urinary tract and ear were more frequent in patients treated with Prolia®. Endocarditis was also reported more frequently in Prolia®‐treated patients. The incidence of opportunistic infections and the overall incidence of infections were similar between the treatment groups. Advise patients to seek prompt medical attention if they develop signs or symptoms of severe infection, including cellulitis. In the same clinical trial in women with postmenopausal osteoporosis, epidermal and dermal adverse events such as dermatitis, eczema and rashes occurred at a significantly higher rate with Prolia® compared to placebo. Most of these events were not specific to the injection site. Consider discontinuing Prolia® if severe symptoms develop. Severe and occasionally incapacitating bone, joint, and/or muscle pain has been reported in patients taking Prolia®. Consider discontinuing use if severe symptoms develop. In clinical trials in women with postmenopausal osteoporosis, Prolia® resulted in significant suppression of bone remodeling as evidenced by markers of bone turnover and bone histomorphometry. The significance of these findings and the effect of long‐term treatment are unknown. Monitor patients for these consequences, including ONJ, atypical fractures, and delayed fracture healing. The most common adverse reactions (>5% and more common than placebo) in women with postmenopausal osteoporosis are back pain, pain in extremity, musculoskeletal pain, hypercholesterolemia, and cystitis. The most common adverse reactions (> 5% and more common than placebo) in men with osteoporosis are back pain, arthralgia, and nasopharyngitis. Pancreatitis has been reported with Prolia®. The most common (per patient incidence ≥ 10%) adverse reactions reported with Prolia® in patients with bone loss receiving ADT for prostate cancer or adjuvant AI therapy for breast cancer are arthralgia and back pain. Pain in extremity and musculoskeletal pain have also been reported in clinical trials. Additionally, in Prolia®‐treated men with nonmetastatic prostate cancer receiving ADT, a greater incidence of cataracts was observed. The surveillance program is available to collect information from prescribers on specific adverse events. Please see www.proliasafety.com or call 1‐800‐772‐6436 for more information. For more information, please see the Prolia Important Safety Information, Prescribing Information, and Medication Guide. Since 2004, Amgen and UCB have been working together under a collaboration and license agreement to research, develop and market antibody products targeting the protein sclerostin. As part of this agreement, the two companies continue to collaborate on the development of romosozumab for the treatment of osteoporosis. This gene-to-drug project demonstrates how Amgen and UCB are joining forces to turn genetic discoveries into new medicine, turning conceptual science into a reality. The scientific information discussed in this news release relating to new indications for Amgen’s products is preliminary and investigative and is not part of the labeling approved by the U.S. Food and Drug Administration for the products. The products are not approved for the investigational use(s) discussed in this news release, and no conclusions can or should be drawn regarding the safety or effectiveness of the products for these uses. 1. Wilk A et al. Post-fracture pharmacotherapy for women with osteoporotic fracture: analysis of a managed care population in the USA. Osteoporosis Int. 2014;25(12):2777-2786. 2. International Osteoporosis Foundation. Stop at One. One Fracture Leads to Another. http://share.iofbonehealth.org/WOD/2012/patient_brochure/WOD12-patient_brochure.pdf. Accessed August 29, 2016. 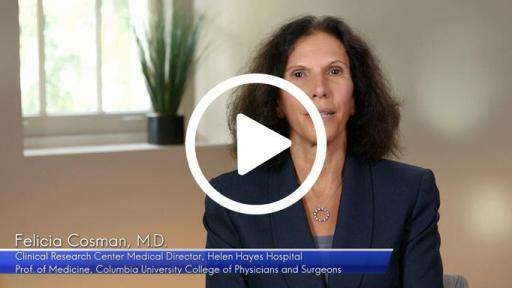 Video of Felicia Cosman, M.D., Clinical Research Center Medical Director, Helen Hayes Hospital, Prof. of Medicine, Columbia University College of Physicians and Surgeons Postmenopausal Osteoporosis Fact Sheet Clinical Fractures: What do they mean for patients living with osteoporosis?